On a Saturday morning if possible I like to tune in to the ABC gardening show on 891, on Saturday the 8/8 there was a 30 minute interview with Australian Organic guru Tim Marshall on growing tomatoes. Tim Marshall is the author of the best selling compost book, Compost: the ultimate organic guide to recycling your garden, and three other books, Bug, Weed and The New Organic Gardener. “Tim Marshall has long been a legend in Australia as an outstanding communicator, writer and broadcaster, specializing in organic techniques’. You need good soil before planting tomatoes you can’t do it at planting time. If you need to add lime,dolomite or gypsum do it now before adding organic matter then add organic matter 1 week later. Tomatoes love food and it is early enough now to dig raw manure and green matter into the soil then wait 6 weeks before planting. You can also use aged manure, you don’t need to wait the 6 weeks for it to break down 3 – 4 weeks is plenty. Once the tomatoes have been planted only use compost or aged manure on top of the soil. Tim suggests planting in September, November and January for a good spread of tomatoes. Don’t let tomatoes touch the ground and make sure you mulch. He suggests the cage system is an easy way to grow and harvest tomatoes. Due to your work weeks ago (now) slow drip feeding is occurring already. Use liquid feeds eg. fish emulsion, seaweed extract, worm farm extract or other teas during growing. Hope this has been helpful, here is the link for the podcast so you can listen to it if you’re interested, he starts at the 1.50min mark. 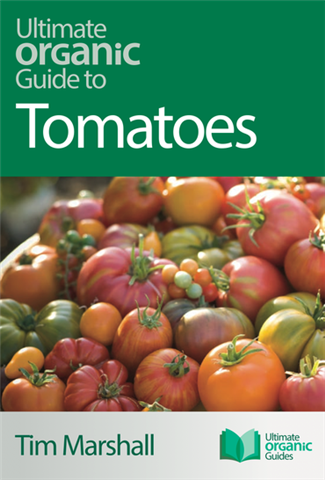 Here is a link to Publishizer the site where you can find more information on Tim’s upcoming book : Ultimate organic guide to tomatoes.